British Cycling technical director Shane Sutton said we have "we have some real podium contenders"
BBC coverage: Live on Red Button on 23 and 24 September and Red Button and BBC Two on 27 and 28 September. 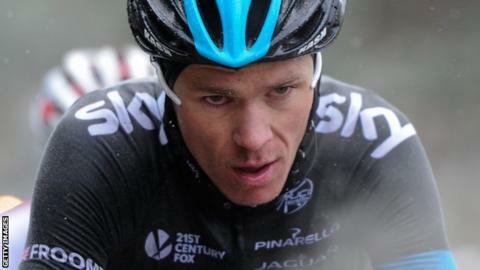 The 2013 Tour de France winner Chris Froome will lead the British team in the Road World Championships in Spain. Froome is joined in the men's road race by Glasgow 2014 gold medallist Geraint Thomas, British champion Pete Kennaugh and Scotland's David Millar. Sir Bradley Wiggins will compete in Wednesday's time trial, alongside Commonwealth champion Alex Dowsett. Lizzie Armitstead leads the six-strong women's squad, which also includes two-time junior world champion Lucy Garner. There is no entrant in the women's time trial on Tuesday following Emma Pooley's retirement because no-one is believed to have medal potential. Millar is racing in a GB vest for the final time before retiring at the end of the season. "Across the board, we have some real podium contenders," said British Cycling technical director Shane Sutton. The championships begin on Sunday.